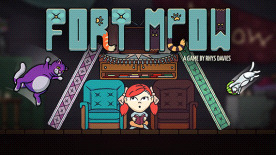 Fort Meow is a pillow fort physics-based puzzle adventure involving cats, destruction and a dusty old manor. Upon finding her grandfather’s journal in the attic, Nia is attacked by a barrage of feline assailants. It seems that her grandmother has become a crazy cat lady since last time she visited, so you will need to defend Nia by building a protective fort out of furniture to keep the cats at bay, while deciphering the mysterious tales hidden within the journal. Build your own custom pillow fort out of household items to protect you from an onslaught of feline assailants as they tumble and claw their way through. Just be careful that your carefully constructed walls don’t tumble down with them. Each item costs you some of your limited window of time before the next onslaught so choose wisely. As you unlock more time you can build more elaborate forts to deal with the increasingly challenging cat-assault. Build and layer your forts with pillows, grandfather clocks, toasters and more. Collect items from around the house using your Grandfather's Move-It-Bot and transport them up to the attic. There are over twenty items to discover, each with a unique property that will help you build the ultimate fortress of protection from the oncoming cat-aclysm. Where are your grandparents and why are there so many cats in the attic? Only by reading the pages of your grandfather's journal can you unravel the clues to this mystery - if only those cats would let you read it. It's up to Nia to follow the clues and save the day. Something cat-astrophic could be afoot. Orange tabbies, majestic chinchillas, dreaded black cats, they are all invading the house and causing mischief. Each type of cat has unique properties and challenges to discover and strategise against. Some are even wearing watermelon stack hats! To succeed you'll need to learn the secrets of every feline assailant and become a master of the kittypedia.